Hope & Mistry's Tale - (2nd Edition* - June 2016) - The sequel to Dirt, Series One and the prelude to Series Two. It is ten years since the war in The Prelates, but on Bind, the unrest is returning. Deoram Ham is a beautiful little fishing village in the far south of Bind. It is a peaceful, simple community perfect for dragon riders who miss their dragon friends and wish to live a life far from the wars they fought. But the peace is not set to last. And as new threats emerge, there are now too few of them to fight back. The only solution is to escape to the beautiful Isle of Hope. Johnson Farthing, the former general and now a farmer, has no choice but to travel north once more to find a boat and rescue his friends and family. Years later and Mistry, once reckoned to be the best dragon rider in history, takes a wagon and horses and makes her way north through Bind, her future uncertain. But something is wrong with her; something is different. 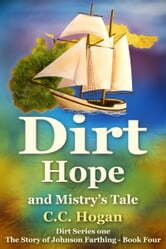 In this important prequel to Dirt, Series Two, Mistry discovers the saga is far from over. "It's the past isn't it?" Mistry said. Find out more at the wonder World of Dirt Website. More information on books plus articles on the world, the people, background histories, the dragons, maps and much more. And look out for Series Two - coming soon! *Note about the second edition - June 2016. This edition contains various corrections to errors in the text and to some name spellings, as well as sorting out some minor inconsistencies. However, there are no changes to the plot, and the dragons are still as lovable and irritating as ever.